For most of this year, the interest rate environment has been dominated by speculation over whether the economic recovery was gathering momentum. Signs of economic improvement, especially in employment, have sent Treasury bond yields and mortgage rates sharply higher in recent months. However, for credit card rates, the demand factor driving interest rates upward is offset somewhat by the improving credit environment associated with a strengthening economy, so the impact on credit card rates has been relatively muted. 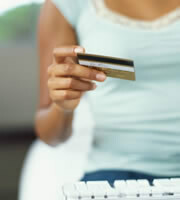 However, there was a development in mid-July which could have a greater impact on credit card rates. On July 16, the Bureau of Labor Statistics announced that the Consumer Price Index increased by 0.5 percent in June. If continued, that would translate to an annual rate of inflation of more than 6 percent, something that would drive all interest rates sharply higher. Month-to-month inflation numbers are too erratic for any one data point to be taken as a trend, but what is concerning about June's inflation number is that it was driven largely by rising energy prices. With oil prices continuing to increase in July, consumers and businesses need to be concerned not only with the immediate impact at the gas pump, but with the ultimate impact on interest rates if this trend continues. The sole change since the last survey occurred in the consumer non-rewards category, where rates rose to an average of 15.48 percent. With an increase in this category while consumer rewards credit cards held steady, the spread between the two categories narrowed to 2.31 percent. This spread has been coming down in stages since peaking at 2.60 percent in mid-May; it is now at its lowest level since early February. Overall, consumer credit card rates have been on an uptrend since the end of March, with the category average having five increases and no decreases between then and now. An environment of generally rising rates makes it especially important for consumers to counter that trend by shopping for the best rates being offered. Student credit card rates remained at an average at 17.42 percent, with no changes for five months now. Students shopping for credit cards would be advised to note that while the overall average for this category has been steady, there are still wide differences among the rates offered to students by different credit card companies. This means shopping around for the best rates, and establishing which rate tier applies to a particular student, can make a significant difference. Business credit card rates remained unchanged, and have held the same levels since the end of April. This suggests that credit card companies view the environment for business credit conditions to be stable, which in turn gives businesses an ideal opportunity to research and select the best credit card rates and terms. Along with the change in consumer credit card rates, there was a slight change in the difference between the average interest rate charged for customers with excellent credit and the overall average rate for consumers. The spread between these rates widened by a single basis point to 4.10 percent. In general, a widening of this spread would mean a deepening of credit concerns, but a shift of a single basis point is not wide enough to indicate any conclusion about whether credit card companies are changing their outlook for consumer creditworthiness.